Deer Valley ski resort - did you know...? Deer Valley is one of those special ski resorts, which not all international skiers have heard of or know much about. Situated near Salt Lake City airport and right next to Park City town, Deer Valley ski resort is named #1 for guest service year after year by SKI magazine. In 2018 Deer Valley was ranked #1 "Overall Resort in North America". Deer Valley receives these accolades because they really do things differently to make to ensure guests have a superior ski experience. Focusing on the finer details is key to Deer Valley's success. 1. Limited number of people allowed - quiet slopes! Deer Valley Resort limits the number of lift tickets it sells & thus the number of people allowed on its ski slopes each day. This ensures the slopes are quiet and lift queues rare, allowing guests to ski to their heart's content! It also means guests can be sure of finding a spot to eat lunch in a more leisurely fashion, without having to fight the crowds for a table. Just be sure to pre-order your lift tickets with us & you'll be one of the lucky ones! 2. Complimentary ski storage - no carrying gear! Deer Valley ski resort offers complimentary ski storage at both its Snow Park base area, where the ski school is and its mid mountain Silver Lake Village base area. When you are ready to head to lunch, just drop off your skis & the valet will store them for you while you enjoy your meal, knowing your skis are safe & sound. Afterwards the valet will hand you your skis, so no searching amongst hundreds of pairs of skis, wondering where you left them! At the end of the day, again just leave your skis with the valet & they will look after them for you until you're ready to start the next morning. This means you don't have to carry your skis to & from the slopes in the morning or evening and you don't have to carry the kids gear either! The ski storage is complimentary and they won't even accept tips, a great bonus. 3. On mountain accommodation - be first on the slopes! 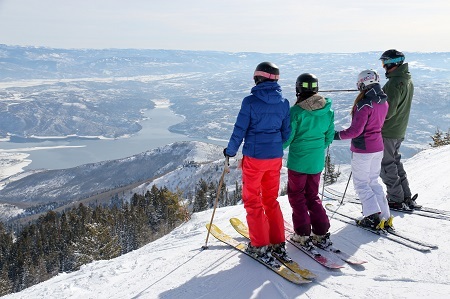 Deer Valley ski resort is one of the few ski areas in the USA which has true mid mountain lodging options. Silver Lake Village is mid mountain and the Empire Pass / Empire Canyon area is located high up on the mountain. This not only means spectacular views & many ski in, ski out lodging properties, but also means that guests staying in these areas can be on the slopes before anyone else gets up there! If they're staying in Empire Canyon (at One Empire Pass, Silver Strike, Shooting Star), guests can head directly up the Silver Strike lift to the Flagstaff area and enjoy first tracks, first thing in the morning. Or if you're staying at The Grand Lodge, jump on the Northside Express lift & ride to the top of Flagstaff Mountain. Guests staying in Silver Lake Village (Royal Plaza, Little Belle homes, Black Bear Lodge) can head up Bald Mountain or to Flagstaff first thing or they can take the homestake lift & ski down to the Snow Park base area enjoying the freshly groomed runs. Deer Valley is one of the few ski only resorts in the USA. Alpine, telemark & mono ski equipment are all allowed, but snowboarders are not. Although a little controversial, Deer Valley has decided to keep its more traditional approach to snow sports & stick to skiing only. 5. Short airport transfer - get there quickly! Deer Valley ski resort has a super short airport transfer, being just 45 mins from Salt Lake City airport. Getting to your final destination quickly after a long international flight can be a godsend for everyone, but particularly those with families. Australian's can fly from Sydney, Melbourne or Brisbane into LA, San Francisco or Dallas and then directly onto Salt Lake City. UK clients can fly from London into Salt Lake City via Paris, Amsterdam or several US cities and be at your accommodation in no time! We hope these 5 tips have helped you get to know Deer Valley ski resort a little better!